I had the pleasure to visit Amanda's kitchen from Kevin and Amanda and make the most delicate, delightful, decadent desserts ever - a Macaron! 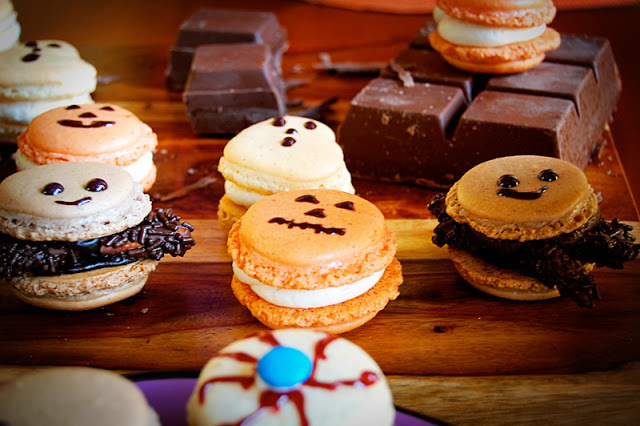 The name doesn't describe how heavenly they are...and we made them fun by decorating them for Halloween! I never had a Macaron before a couple of weeks ago when Amanda's friend Shaina from Food For My Family came down South to do some baking. Well, I just had to drop by and introduce myself and offer help. 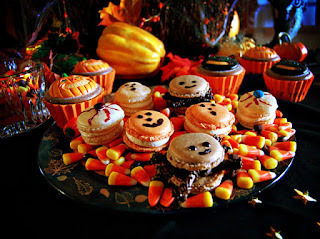 ;-) The end result - I'm totally and completely hooked on Macarons! 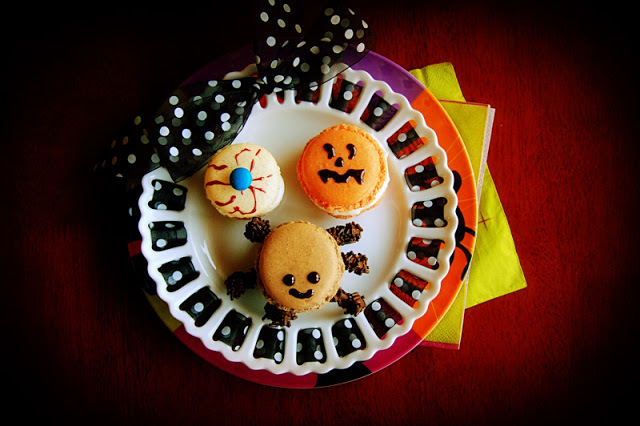 Amanda and I were shopping Saturday night and got the idea to make Halloween Macarons. From there, the ideas and possibilities started coming out of our mouths at 90 miles a minute. 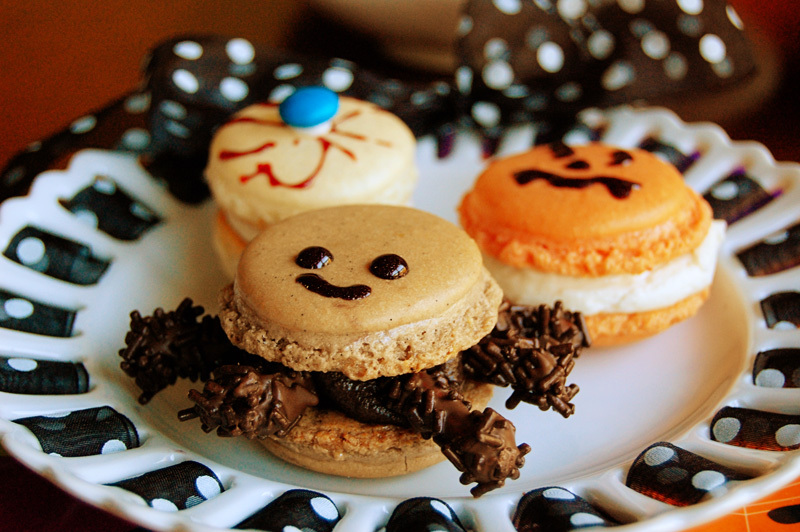 :) This is the first of Grinning Like An Idiot and Kevin And Amanda Macaron making and decorating series! 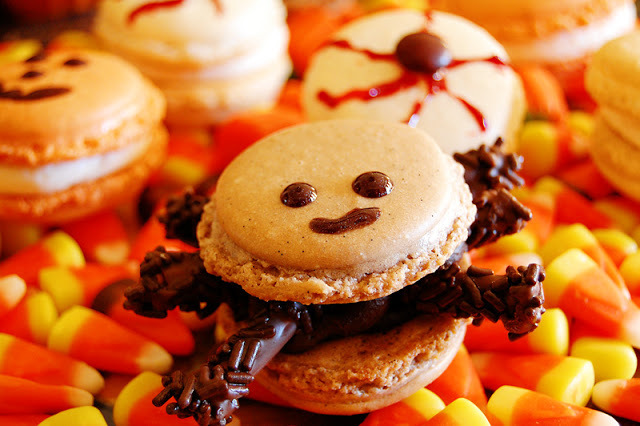 So, be sure to drop by Kevin And Amanda for more pictures and instructions on how to make these Macarons. If I can do this, ANYONE can do it! And I'll say this again, one of the advantages to being Amanda's helper, I get to sample...seriously I got to eat this!!! Look at the space between the crust and the moist cookie! Oh and the Chocolate Butter Cream Frosting - I'm drooling as I'm writing!! 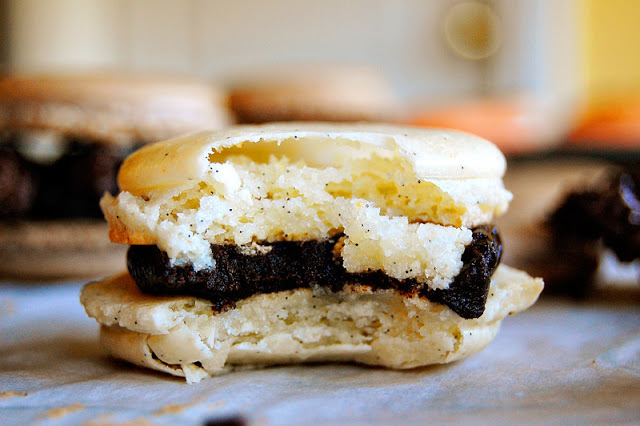 Macarons call for vanilla beans and almond flour (new to me :)). Amanda showed me how to get the vanilla seeds out of the vanilla bean (she called it vanilla caviar :) fitting, I thought). It was easy! Slice the vanilla bean down the middle, then use the back of the knife and scrape out the vanilla seeds. Scrape the seeds into the food processor. 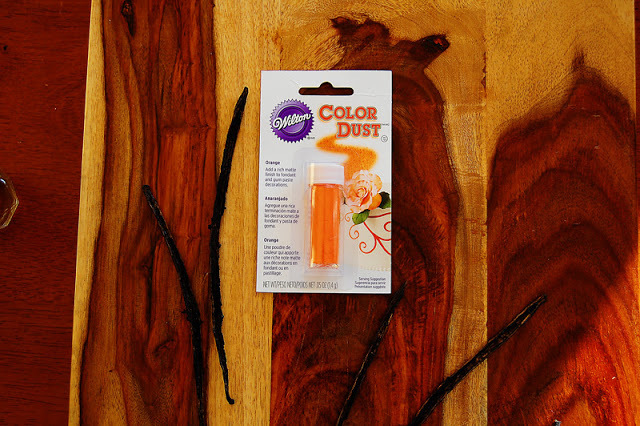 To make the Jack-o-lanterns we used Color Dust, found at Hobby Lobby, of course. 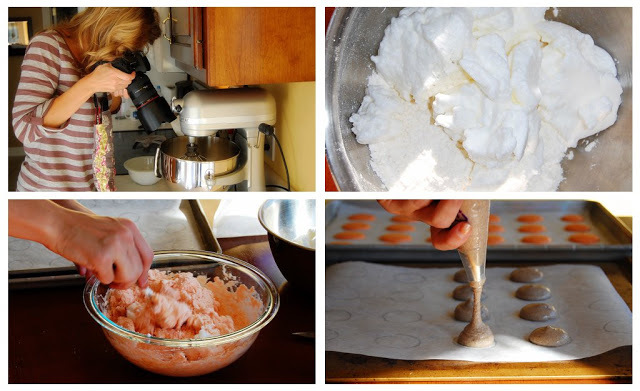 :) It's important to use the dust rather than the gel or other forms of food coloring to ensure the Macaron batter is the right consistency. For the Jack-o-lanterns, she whisked in the food coloring dust. For the Spiders, she whisked in the cocoa powder. Our ghosts and eyeballs stayed vanilla. And yet another step I've never done - sifting (and I'm older than she is). :). 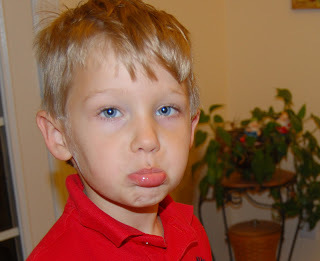 Amanda's website has documented proof that I've sifted. As part of our prep, the egg whites had to "age". I was surprised at the yellow-greenish color the aged egg whites took. You can let them age for up to five (5) days in the refrigerator, then let them set out overnight. As soon as Amanda got home from our Saturday night shopping excursion she separated the egg whites, covered them with a paper towel and placed in the refrigerator. On Sunday night, she set them on the counter with the paper towel over them until I arrived Monday morning. Then we folded the egg whites into the dry ingredients. It is important to not fold more than 50 times. We actually counted. Then we put the batter into the pastry bags and dropped the batter onto the prepared cookie sheets. And let the batter rest for 45 minutes before baking. Baked at 280 degrees for about 15 minutes in the center of the oven. When they came out of the oven they were PERFECT! I felt like a kid in a candy shop. The fun part is coming, the decorating and eating. YEAH!!! 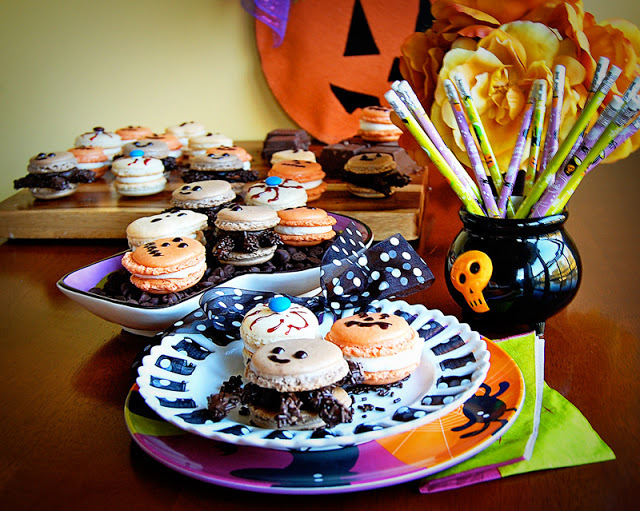 We paired up the Macarons for a top and a bottom and began to decorate. For the Jack-o-lantern and ghost faces, we used black gel icing. 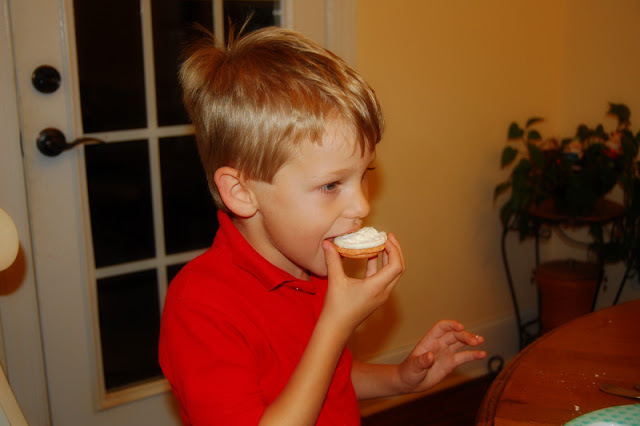 Next came the SUPER YUMMY Butter Cream icing in vanilla for the Jack-o-lanterns, eyeballs and ghosts. Chocolate Butter Cream icing for the spiders. For the eyeballs we used red gel Food Coloring and topped each with an M&M. For the spider legs, we used pretzels dipped in melted Almond Bark Chocolate and then rolled each in chocolate sprinkles. Then set the spider legs aside to set up. 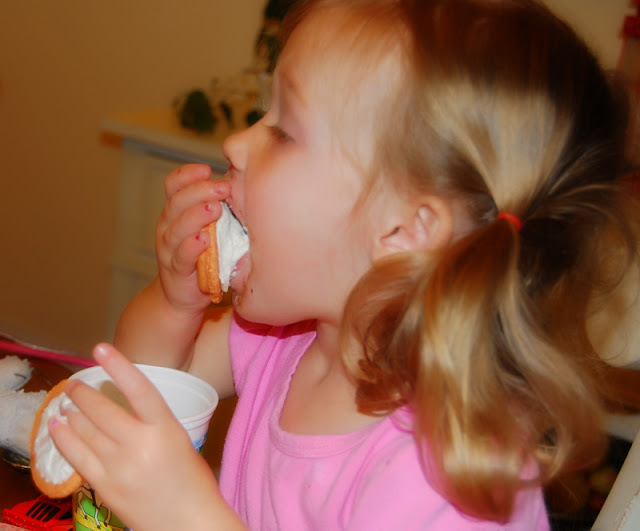 While the legs were setting up, we put a dollop of Chocolate Butter Cream icing on one-half of the Macaron. Once the legs were set up, we snapped off the plain pretzel part, placed it in the chocolate and added another dollop of Chocolate Butter Cream icing and topped it off with the top of the Macaron. Picture time! This is where I come in handy. :) We did two setups, one at Amanda's house and one at my house. Amanda put together a nice clean setup with a white plate enhanced with a black and white ribbon. A bunch of pencils for a nice contrast/texture to the picture. But my favorite part of her setup is not yet visible...keep scrolling! Ahhhh - CHOCOLATE! 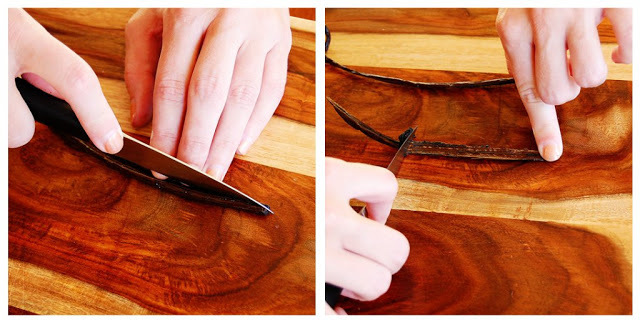 She set up a beautiful cutting board and enhanced it with some of the leftover Almond Chocolate Bark. 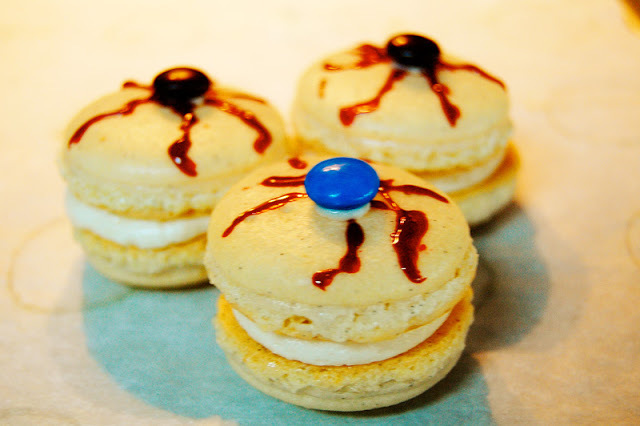 Every one of our Macaroons was photogenic! The next day we met up at my house where my dining room was already decorated for Halloween. And for proof that they are not only pretty to look at but good to eat! 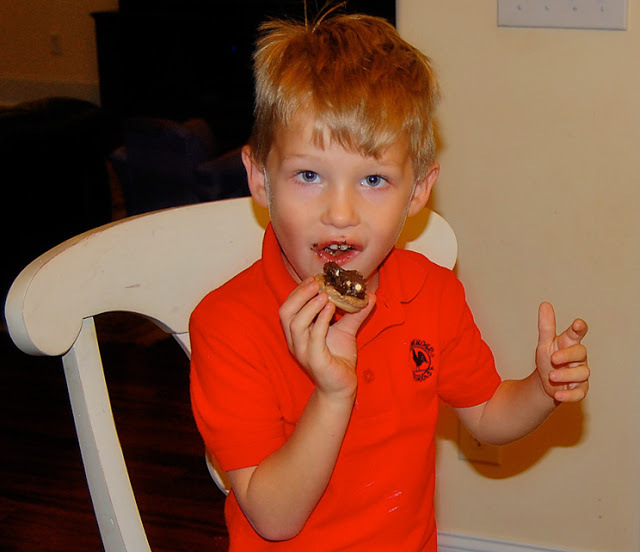 Of course, the Lil'man went for the Chocolate Spider. 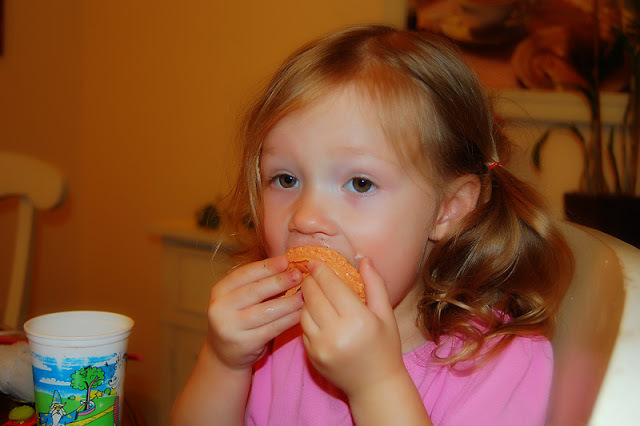 Em pulled it apart like an Oreo and ate the icing first. She looks like she is lost in another world. I let them eat two each...and no more for that night. Let your batter rest on the cookie sheet for at least 45 minutes before baking. 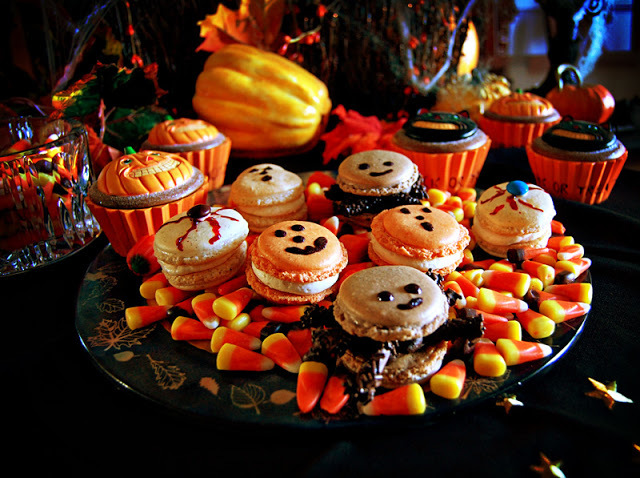 Up to 5 days before making macarons, separate the egg whites, cover loosely with a paper towel, and store in the refrigerator. The night before making macarons, set them out on the counter to come to room temperature. Place almond flour, powdered sugar, and the contents of a vanilla bean into a food processor and process until fully combined. Move to a large bowl and whisk in one teaspoon of cocoa powder for chocolate macarons, or one teaspoon of powdered food coloring for colored macarons. 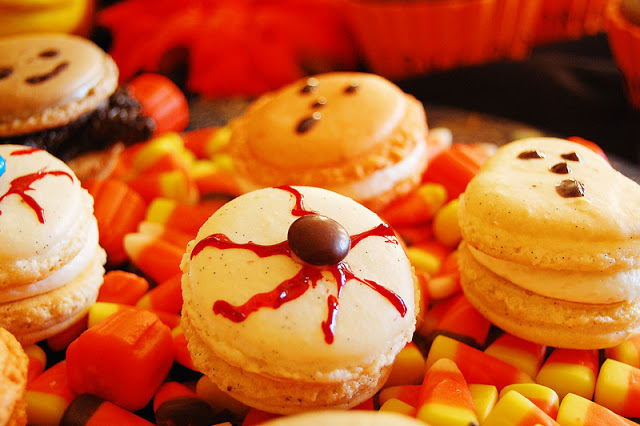 Leave plain for vanilla macarons. 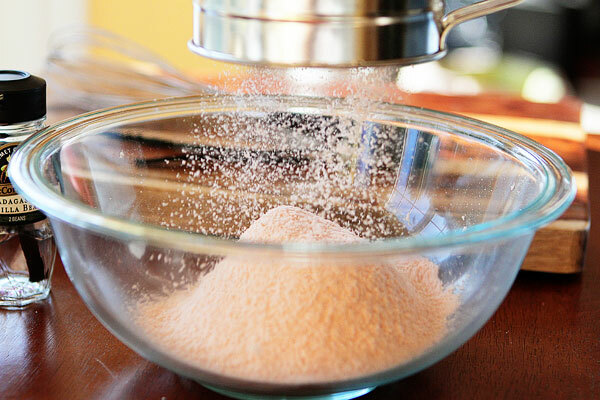 Whisk to combine, then sift and set aside. 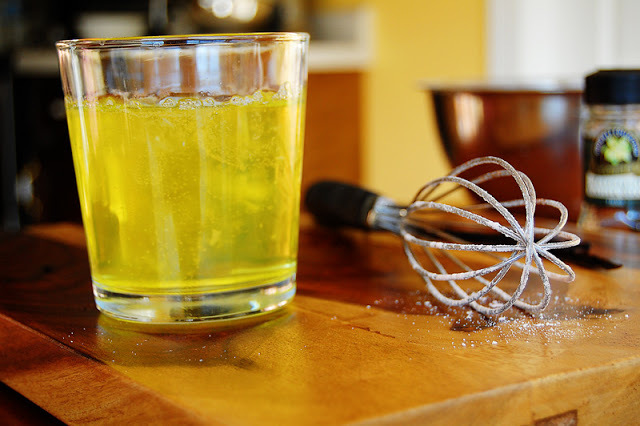 With a mixer, whisk the egg whites on medium-high speed until foamy. Add in granulated sugar and continue whisking until the egg whites have stiff peaks. 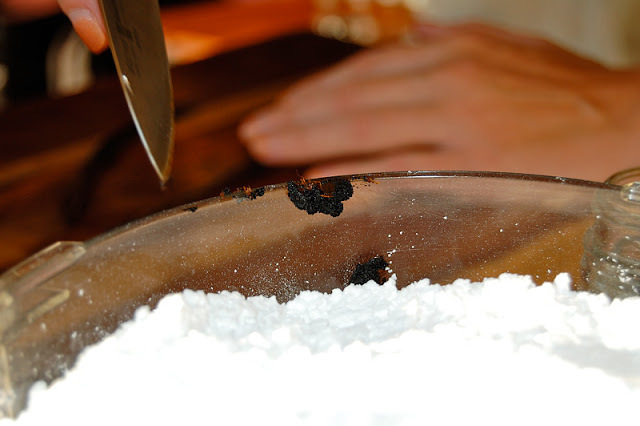 Add the egg whites to the flour and fold to incorporate until the mixture is just smooth, using no more than 50 strokes. 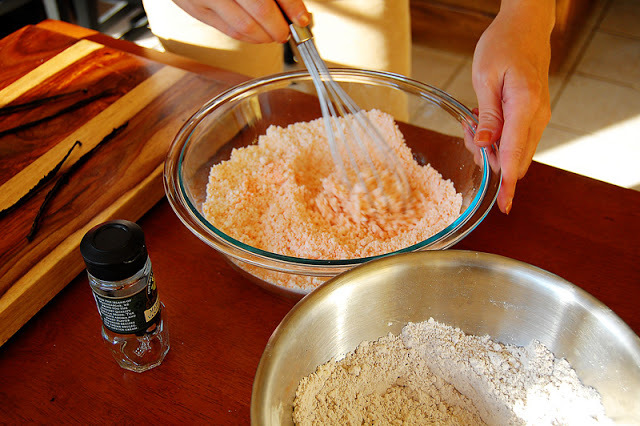 Fit a pastry bag with a large round tip, and fill with macaron batter. Pipe approximately 1-inch circles onto a baking sheet lined parchment paper. Let the batter rest on the pan at least 30 minutes before baking, to form a strong skin to help keep the macarons from cracking in the oven. 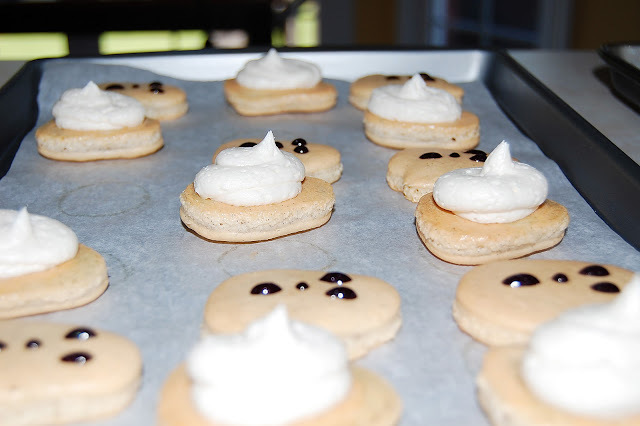 Bake the macarons at 280 degrees F for 15-20 minutes directly in the middle of the oven. 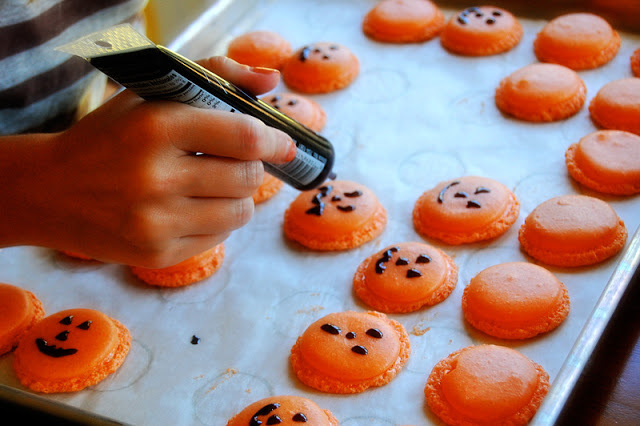 To test for doneness, gently touch the top of a macaron to make sure it’s dry. Then gently try to lift the macaron from the parchment paper. If it comes away pretty easily, they’re done. If it doesn’t come up and the top breaks away, they need to cook longer. Keep checking on them every two minutes until the bottom is dry. Once removed from the oven, allow the macarons to rest on the pan for 10 minutes to finish cooking before trying to remove. Cool completely before frosting. Melt chocolate chips in the microwave, stirring every 30 seconds until smooth. Allow to cool for 5-10 mins. 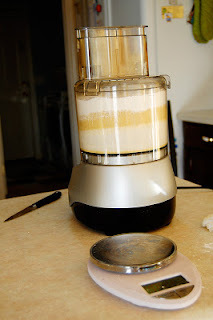 Meanwhile, combine butter, sugar, cocoa and salt in a food processor and process until smooth. Scrape the bowl as needed. 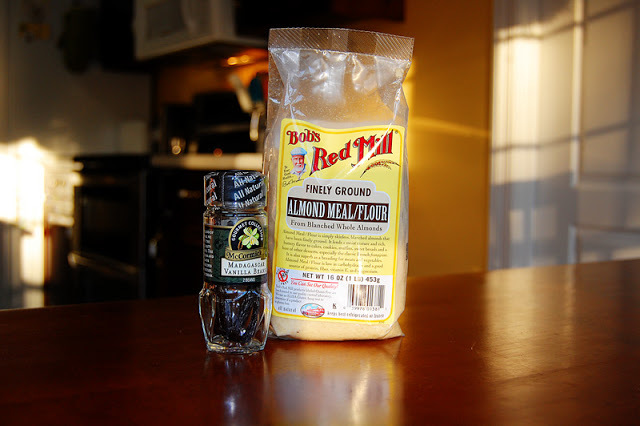 Add the corn syrup and vanilla and process until just combined. Add the melted chocolate and process until smooth and creamy. Macaron recipe adapted from Shaina at Food for My Family. 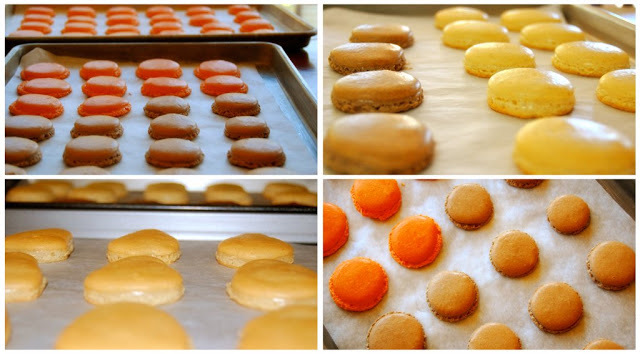 For more macaron tips, check out her step-by-step macaron tutorial.